Two different tools with (typically) two different goals and uses in mind. Binoculars are the most versatile optics on the planet. Designed for hand-held use with both eyes and to be carried and easily portable, modern binoculars have a huge array of features, uses and magnification ranges. Many spotting scopes top out at 60x magnification. Because they are designed to be used in the day to view distant object anything nearing or above 60x will normally be affected by ambient conditions in the atmosphere. Air currents, dust particles, heat waves, all these and more can turn 60x magnification into a blur and make it very difficult to see something. 60x magnification power means the image is 60 times the size of what you’d see with the naked eye. Look in any decent optics store and you’ll find that general use binoculars range from 1x magnification all the way up-to 12x magnification. 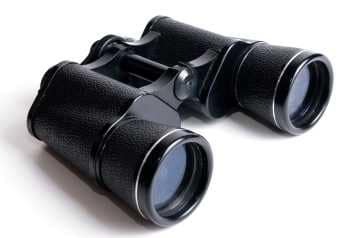 You can however find specialist binoculars with magnification powers of anywhere from 15x to 100x. These are generally designed to be tripod mounted and the highest 60-100x magnifications used at night for things like astronomy. 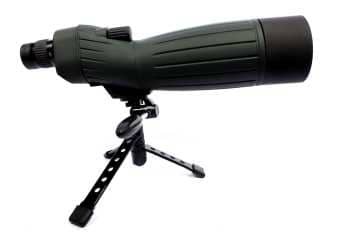 Whilst binoculars are available with high 100x magnification, your typical spotting scope will be much more powerful than your typical binocular. Because you usually hold binoculars in your hand, the more you magnify an image the more you also magnify the movements in your hand caused when you try to hold something steady. If you try and use binoculars at 10x-12x magnification without a tripod or something to rest against, all you’d better have steady hands or all you will see is a shaky image. Because binos are designed to be portable that’s the reason they generally top out at 10x-12x magnification levels (with the exception of the upto 100x specialist tripod mounted binos). A good pair of binos can weigh the same as a similar quality spotter. There really isn’t a clear general winner here. Binoculars however are designed to be portable. They can be worn round your neck and compact versions can be pocketed easily. Whilst ultra-portable binoculars won’t be as powerful as the average spotting scope they’ll be a lot easier to carry than even a spotter in a good case. Close focus is the minimum distance away from you an object can be for an optic to be able to focus on it. Both of these types optics are really designed to view objects at a distance. But there are certain applications like birding or bird-watching where you may want to focus in on something that’s only a 6 feet from you. In general as the level of available magnification increases so does the closest available focal point. You’ll therefore find that because general purpose binoculars have a lower magnification level than spotters they’ll also have a nearer close focus point. Field of view defines the amount you can actually see through the optic. A bigger field of view means you can see more. The higher the magnification power of a lens the smaller the available field of view becomes. Generally as spotting scopes are higher magnification than binos they also have a smaller field of view. Binoculars are also available with ultra wide-angle design eyepieces allowing you to more easily follow moving objects and targets and take in much more of the view. The bigger the objective lens the better the picture you’ll see. The size of the lens is the second number after the x in the specifications for binos and scopes, i.e. 20-60x70mm is an optic with a 20 to 60 x zoom and a 70mm objective lens. Don’t be tricked into thinking that bigger is always better when it comes to lenses because quality matters a LOT. Good quality generally beats size if you’re unsure. Spotters come with objective lenses in sizes ranging 45mm to 100mm but 60-80mm is common. Binoculars can have objective lenses ranging anywhere from 25mm for compact binos to 42mm for general all-purpose outdoors bins to 100mm for giant astronomy binoculars. But the typical binocular has a smaller objective lens than the typical spotting scope. Typical spotting scopes have bigger objective lenses than binoculars. Binoculars are straight, typically you point them where you want to look and you look straight into them. Spotting scopes can be either straight or angled. Yes, you CAN get binoculars with angled observation eyepieces, but they certainly aren’t common. Sometimes this comes down to personal preference, but the reason you can get angled spotting scopes is pretty simple. If you’ve got a scope mounted to a tripod it’s easier IMO to bend down to look through an angled eyepiece than to lower your whole body to the level of the scope. Typically, you’ll find mid-range binoculars to be less expensive than mid-range spotting scopes. There’s less magnification power involved and smaller lenses, that’s where the increased cost of the spotter comes from. You can get your run of the mill standard binocular, compact pocketable lightweight binoculars. There’s wide-angle variants for taking in more of the scene. 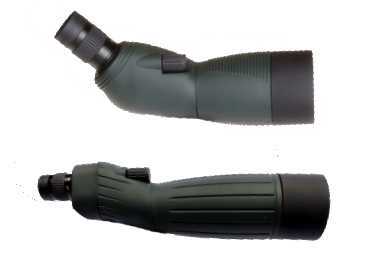 Binoculars can also be fixed magnification or zoom. They can be waterproof for marine and outdoor uses and armored for when you’re using them on the move or in a tough situation. Spotting scopes come in most of the same variants and you can adapt them with wide angle eyepieces but if you check out the stores of some major online retailers on thing will become apparent. You can find hundreds of spotting scopes on the market of different qualities, some angled and some straight. There’s a VAST choice of binoculars out there with thousands of make and model combinations there’s a specific binocular to suit pretty much any use. Yep, literally everything above and probably more. You can find a binocular to do pretty much anything you can do with a spotting scope. Typically though the use will depend on the distance to the target. At longer ranges you’d normally favor a scope over binoculars. Nice comparison dude! Really informative and logical. Like it.